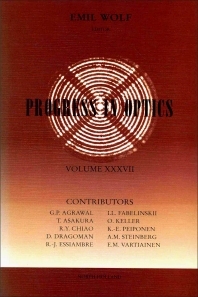 This volume presents six articles describing theoretical and experimental research of interest in optics. The articles review applications of the Wigner distribution function in optics and optoelectronics, examine the mathematical foundations and the applicability of Kramers-Kronig relations to data inversion in linear and nonlinear optical spectroscopy and explore concentration and anisotropy fluctuations. Chapter four reviews the field of fibre-optical soliton communication systems, and includes discussion of periodic amplification, timing jitter and its control and time-division multiplexing. Chapter five focuses on theoretical aspects of the local field electrodynamics in mesoscopic media. The final chapter reviews experiments and theories concerning the time it takes for a photon or an electromagnetic wave packet to tunnel across a barrier.